Portrait of Grammy and Academy award winning musician of Che Rhymefest Smith as he buys his father's old house then decides to track his long disappeared father down. What happens when he reconnects is the film. Deeply moving story begins on a dizzying high as Che buys the house and then locates his father who has been living on the street and in shelters for the last 20 years. Che sees it as an opportunity to get the paternal love he always craved, but how things play out are different than he or we expected. This fantastic look at what it means to be a father contrasts Che's dance to reconnect with his dad with his own efforts to be a father to his own children. 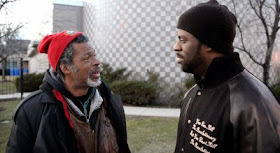 The film also deftly adds yet another layer into the mix as Che, a radio talk show host, expands the discussion to the question of single parenting in the black community as he talks to people on the air and engages with some kids in person. Frankly there is so much going on I don't know where to start talking about it. Perhaps the best thing that I can say about the film is that as soon as the film ended and I wiped the tears out of my eyes I sent a text message to my dad telling him I loved him. I have no doubt that the text confused the hell out of him, but that's okay I needed to tell him how much I loved him. This is a wonderful film. As I've indicated I was moved to tears by it. One of the things that I loved about the film is that it doesn't unfold as expected. What should be the rousing finale is the start of the film and it goes from there. By not taking the path you'd expect you'll wonder where it all is going. Not to worry there is a point to it all and by the time of the final fade out you'll want to call your dad- or your mom. To be honest there is much I want to say about the film but I need another pass or two to be able to do it justice. The film is just too full of ideas and emotions to get it all after one go round, especially when the film wonderfully blindsides you and turns out to be something special. Put this one on your list and go see it.